Glowing reports hold true. The Trio con Brio Copenhagen clearly occupies a lofty perch in today's musical scene. Acknowledged as one of the finest piano trios in the world, the Trio con Brio Copenhagen is about to enter a banner year - 2019 will mark their twentieth anniversary. For a group that views each new year as a call to deepen and enrich their interpretations, it seems a fitting time to take their measure of one of the supreme journeys a piano trio can take; starting in May 2018, Orchid Classics will be releasing their multi-volume traversal of the complete Beethoven PIano Trios. 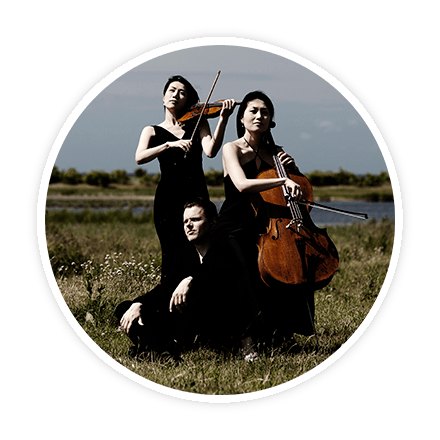 The Trio was born out of an idea of the coming together of "musical pairs" - of the two Korean-born sisters, Soo-Kyung Hong (cello) and Soo-Jin Hong (violin), with Soo-Kyung and her husband, Danish pianist Jens Elvekjaer. They quickly gained a reputation for their fresh and contemporary approach to the core repertoire. "Works by Beethoven, Schubert and Brahms are transformed in their hands into the alive-and-kicking music of today" said Danish Broadcasting's Esben Tange. Winning almost all of the major competitions for piano trio - including the ARD (Munich), Vittorio Gui (Florence), Trondheim Competition (Norway), Kalichstein-Laredo-Robinson (USA), Allianz Prize (Germany) and the prestigious "P2 Artists Prize" (Denmark) - they are regularly heard at the world's leading venues and concert series. Among these, Carnegie Hall, Lincoln Center, Wigmore Hall, Berlin Pierre Boulez-Saal, Concertgebouw, Elphilharmonie Hamburg, Seoul Arts Centre, Louvre Paris and of course their beloved "home venues", the Royal Library and the Tivoli Concert Hall, in Copenhagen. Trio con Brio Copenhagen plays a central role in Scandinavia's vibrant contemporary music scene. Leading composers have dedicated works to the Trio. They were enormously honoured that Per Norgard dedicated to them a new piece celebrating his 80th birthday in 2012. In January 2016 the trio presented the world premiere of Bent Sorensen's Triple Concerto with the Danish National Orchestra, a work that won the prestigious Grawemeyer Award. They premiered Sven-David Sandstroem's Triple Concerto, a work that marks his 70th birthday. Reviews are fulsome. "One of the greatest performances of chamber music I've ever encountered," praised American Record Guide. Gramophone wrote, "Superb...Any group would be hard-pressed to imitate this blend of verve and poise..." Their Mendelssohn album was chosen by the UK's Classic FM as the Best Chamber Music Disc of the year: "Every phrase soars and pulsates with the excitement of a fresh discovery as the Copenhagen players go the full distance with playing of skin-rippling sensitivity ... sensational playing...". Their Tchaikovsky and Smetana recording was hailed by The Guardian, "... Trio con Brio Copenhagen scale Tchaikovsky's heights with the verve their name suggests ..."
The Trio are artistic directors of the Copenhagen Chamber Music Festival, the Chamber Music Festival on Lundsgaard Estate in Kerteminde and the Hellerup Chamber Music Society in Copenhagen. Soo-Jin plays an Andrea Guarneri violin, Soo-Kyung plays a Grancino cello, and Jens is Denmark's first Steinway Artist. Both string players are endorsed by Jagar Strings and Thomastik-Infeld Vienna. Twenty years is a milestone in any ensemble and, says Jens Elvekjaer, they all knew right from the start that they would find their musical identities as a piano trio: "There is something about the configuration of a trio, about that triangle, that somehow focuses and amplifies the special understanding that we all have as people and as musicians. It is both a freedom and a fulfillment." "Trio con Brio Copenhagen has throughout their career been hailed by press and audiences for their 'unique sound and unity of interpretation'"